Determine the Best Small Business Loan that’s right for you. Getting a business loan can be a bit overwhelming for many small business owners. First you will need to determine the loan type. There are several choices when considering a small business loan; the loan product you choose is usually best determined by what you will be using the money for. Then there is the paperwork and the qualification checklist. In the sections below, we’ll walk you through the basics of choosing the right business loan product and applying for a small business loan. Guaranteed by the US Small Business Administration (SBA). SBA loans are government-guaranteed, long-term loans. The guarantee allows SBA lenders to offer low-interest rate loans to business owners who might not qualify for a bank loan. SBA works with lenders who make the loans, the SBA does not make loans directly. Similar to a traditional bank loan, with a term business loan, you borrow a lump-sum amount upfront, which you pay back (along with fees and interest payments) over a set period of time. This is similar to a revolving credit card account.With a business line of credit, you can borrow up to a maximum credit limit and only pay interest on the amount of capital that you borrow from your credit line. A small business startup loan is difficult thing to acquire. However, it is one of the most requested types of loans simply because of the number of new businesses being started. This type of loan is generally based on the credit history of the owners and requires a personal guarantee. Invoice financing is an arrangement that allows you sell your unpaid invoices to a lender, who pays you a portion of the invoice amount upfront. The remaining percent (usually 20%) is held until the invoice is paid. With equipment financing, the lender will provide you with the funds necessary to help purchase the equipment. Similar to a term loan, you then pay back the total amount borrowed, plus fees, for a set period of time. The newly acquired equipment is generally pledged as collateral. What do you need a business loan for? Choose the right type of loan for your small business. Simply ask yourself or discuss with your partners or financial advisor why you need a loan and what will the money be used for. As we discussed above, there are several types of loans depending on your business goals and circumstances. If you need working capital; for example to hire employees to fulfill a new client order you may want to consider a business line of credit. A business line of credit is ready money when you need it. Are your customers late in paying their invoices and putting a strain on your cash flow? Then perhaps invoice financing is the right choice. How Much of a Loan Can You Afford? If you are going to take out a loan, be sure you have the ability to pay it back. In addition, be sure you borrow as much as you need. There is such a thing as borrow too little or too much. Take your time and use a few of the following tools and analysis to help you figure the right loan amount. Not sure how much of a loan you need or can afford? There are a few calculations that you should perform to make an informed decision. Let’s take a look at the three common tools for evaluating how much you should borrow. Calculate Your Debt Service Coverage Ratio (DSCR). Understand how much you should borrow based on an objective analysis of your business situation. DSCR can be calculated on a monthly or annual basis. Let’s examine a hypothetical example. Let’s take an average month of operations sales and expenses. Let’s assume the cash flow of your small business is $6,000 (gross sales minus expenses). Now let’s assume that your loan payments will total $1,500 per month. That makes your DSCR a 4, which is pretty strong. Most lenders will look for a score of at least 1.5 and definitely above a score of 1. A DSCR of less than 1 means you don’t have enough free cash flow to repay your loan from business operations. This is a basic, but often overlooked exercise to determine whether it is prudent to borrow money for your business. Often, a small business owner will come upon a seemingly great idea for their business and quickly act to make it happen before carefully evaluating whether it makes financial sense. The ROI analysis is not an easy task because it requires that you simulate business activity and speculate about unknown outcomes. However, a “best case/worst-case” analysis should be considered. One of the benefits of doing the ROI is to determine whether the amount of the loan is sufficient or too much. Chances are that if you own a small business, your lender will place a lot of importance on your personal credit score and your credit history. In fact, this is likely the most important factor in the determination as to whether you are granted a loan, the amount of the loan and your interest rate. If you feel that you have erroneous information on your credit report you have a few options. Each of the major credit reporting agencies must provide you with a way to dispute any negative information on your credit report. Once disputed, it is the obligation of agency reporting the negative information to provide proof of its validity within 30 days. If proof is not provided within this period of time, the derogatory information is automatically removed by law. If you have any outstanding debts, contact your creditors, pay-off your debts and ensure that they report the payoffs to the credit reporting agencies. Understanding how your credit score is calculated can be helpful in helping you improve it. 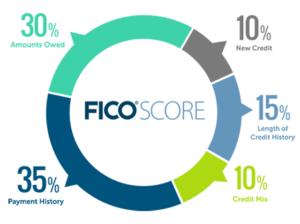 Below is an approximate breakdown of what goes into your credit score. A large percentage of new businesses will fail within the first five years of existence. 30% of small business fail in their second year, and. 50% of small businesses fail after five years in business. Finally, 30% of small business owners fail in their 10th year in business. So it’s understandable that lenders will want to know that your company will be able to survive long enough to repay its loan. Most lenders will want to see that your company has been around for longer than two years and continues to grow. This is pretty obvious. If your company does not have sufficient revenue, it wont be able to repay its loans. Lenders will need to see that you have sufficient free cash flow to repay your loans. In most cases, a lender will qualify you for a small percentage of your annual revenue to be sure you’ll always have the cash on hand to make your loan repayments.